In a surprisingly strong attack, GOP presidential hopeful Mitt Romney said Republican rival Rudy Giuliani had turned New York City into a sanctuary for illegal immigrants during his two terms as mayor. Immigration is a hot-button issue in the GOP and may play especially well in Iowa, an early battleground state where the federal government has raided meat processing plants employing illegals, and where some longtime residents feel their pay is being undercut by cheaper-working immigrants. "If you look at lists compiled on Web sites of sanctuary cities, New York is at the top of the list when Mayor Giuliani was mayor," Romney said at while campaigning in Iowa. "He instructed city workers not to provide information to the federal government that would allow them to enforce the law. New York City was the poster child for sanctuary cities in the country." Giuliani, also campaigning in Iowa, offered this response: "Frankly, that designation would not apply to New York City. What you got to look at in fairness to is the overall results — and no city in terms of crime, safety, dealing with illegality of all different kinds has done a better job than New York City." For contrast, Romney has pointed to his own performance on immigration as the governor of Massachusetts. Romney deputized state police to enforce immigration laws and denied driver's licenses to illegal immigrants. 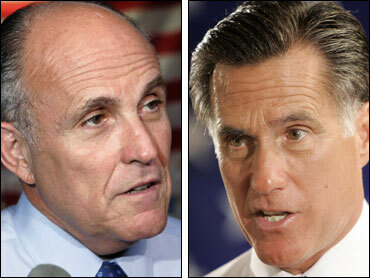 Romney's attack on Giuliani came just three days before the Iowa Straw Poll, a nonbinding beauty contest among the Republican presidential contenders. In the days leading up it, Romney is airing a new television ad in the state in which he encourages supporters to attend the event, portrays himself as an outsider to Washington and takes swipes at both Republicans and Democrats on the immigration issue. Giuliani and Arizona Sen. John McCain are not participating in the straw poll.